Safety Matches portraits three different couples. The mirror like person stands for the “other” personality we all own. 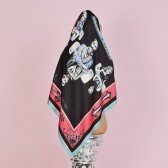 This scarf is dedicated to the people who wear their everyday uniforms to work but always carry and preserve an artistic personality, here symbolically illustrated with tattoos. 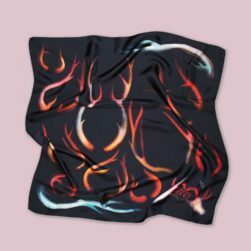 Safety Matches scarf has a unique personality, and it says it straight: “Amor Vincit Omnia”( Love conquers all).